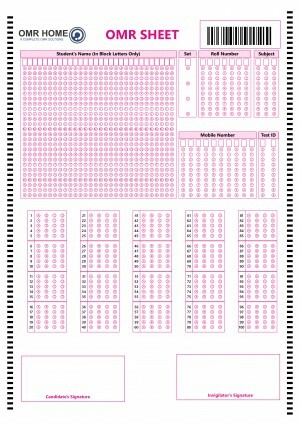 Here, we have provided an OMR Sheet for 100 questions designed by OMR Home. OMR sheets are used for offline examinations that have objective or multiple choice questions, anyone can download and use for practice. You can also get your personalized designed OMR sheets to assess your candidates enriched with all the features that Verificare OMR software has to offer you. In the sheet, We have divided questions into 5 rows with 20 questions each. Every row has 5 sets and every question has 4 options. The students are instructed to completely fill the answer on bubble sheet. The bubbles should be marked with black or blue ball point pens and gel pen should be avoided. Multiple bubbles should not be filled for the same question. The bubbles need to be completely darkened. Tick marks or cross marks should be only made if instructed. Avoid putting any stray marks on your OMR sheet. OMR Home is a complete hub providing all sorts of OMR solutions, with its diverse multi feature software, Verificare. Right from printing of sheets to evaluating the result, Verificare covers your entire OMR based assessment requirement. Our Robust client centric service aims at achieving satisfaction and trust. What is the advantage of using Verificare OMR software? It is the most cost-effective and feature enriched software that gives you the ease to conduct large scale assessments without any hassle. It takes hold of the complete process of assessment right from printing till evaluating the OMR sheets and also generating the result. Which scanner should be used to scan the OMR sheets? Document scanners are the one that are mostly preferred but Verificare OMR software has the flexibility to support any type scanner like flatbed/ADF/MFP without compromising on the efficiency during the process. What are the dimensions of OMR sheet? Standard dimensions that are followed while printing the OMR sheet is A4 size that is a width of 8.5 inches. With Verificare you don’t need to consider the dimensions as it is efficient in printing OMR pattern on any sheet that you want. What is the sheet scanning speed of OMR software? Verificare can scan the OMR sheets at a speed of 300 sheets/min. Its efficiency remains stable irrespective of the type of scanner that you are using. Does OMR software contain any anti cheat feature? Yes, mostly OMR software is enabled with inbuilt feature to curtail the issue of cheating while conducting assessment. Verificare is robust software and comes with Artificial Intelligence that detects the percentage of cheating or any other error in the OMR sheet. We have different types OMR software in the market, but Verificare OMR software stands out because of its optimum features and durability. Its cost effective service makes your assessment conducting experience a comfortable task in which you don’t need to count on your manual skills or logistics.